This past year marks the 25th year of operations for the District's flash flood prediction program (a.k.a. F2P2). Many individuals involved with the program when it began in 1979 are still involved today. Some of the more notable personalities include: District Executive Director Scott Tucker and our Floodplain Management Program Chief Bill DeGroot; Eve Gruntfest, Professor of Geography at the University of Colorado at Colorado Springs (Eve was involved with the early research work for the District following the 1976 Big Thompson Canyon flash flood that lead to establishing the F2P2); Larry Stern, Boulder/Boulder County Director of Emergency Management (Larry was a Sergeant with the Boulder County Sheriff's Department in 1979); Don Van Wie, Principal with OneRain Incorported (Don was a Captain with the Boulder County Sheriff's Department and his company currently maintains the District's automated flood detection network); John Henz, Senior Principal Meteorologist with HDR Engineering (John was the President of GRD Weather Center, which became the first private meteorological service for the F2P2), Bob Glancy, Warning Coordination Meteorologist with the National Weather Service in Boulder (Bob was employed as a forecaster by GRD in 1979). I undoubtedly have missed mentioning a few other important players, but this list should give you some idea about the continuity of this long-running program and the commitment level of those involved. As for me, I was first introduced to the program in June of 1984 when I ruined my car on my way home from work by driving into a severe thunderstorm and flood in Wheat Ridge and Arvada, which happened just a few days after starting my new job at the District. 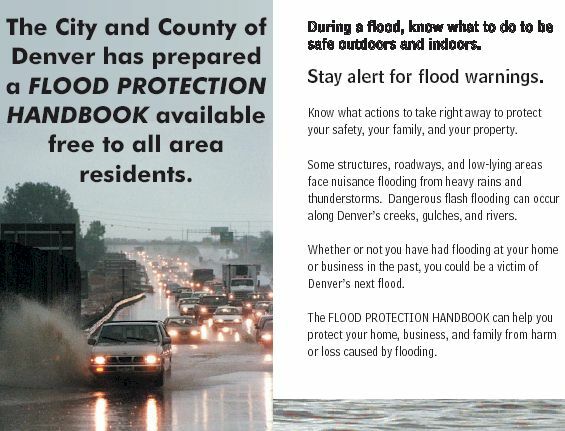 A flood protection handbook for Denver residents and businesses was completed last May and made available free to anyone wanting a copy. It contains helpful advice on what individuals can do before, during and after a flood to protect their property and lives. The project was a joint effort between the Mayor's Office of Emergency Management and the District. The handbook was publicized by mailing 4500 English and Spanish language color brochures to Denver addresses in or near known floodplains. Printed booklets may be obtained from the District or Denver OEM, or by visiting the Denver Public Library. You can also download a color version of this handbook from both the District and Denver websites. This is the third handbook of its kind that the District has helped local governments develop. Early versions were developed for Arvada and Boulder County. A new project is underway to develop a flood safety information website for Boulder, complete with video clips and other modern multimedia features. The District and the City of Boulder funded this $30,000 initiative, which will likely be expanded to include other Front Range communities. Marshall Freck with the Texas Environmental Center will be conducting the work. To learn more about this project visit the TEC website floodsafety.com. 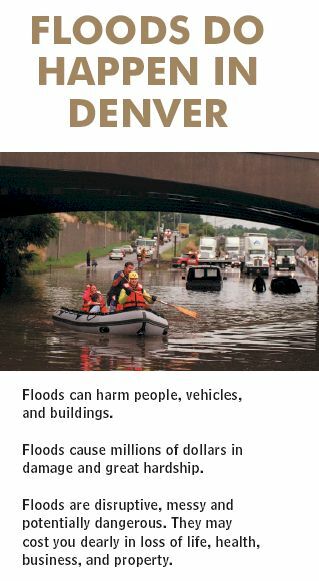 Last year's issue of Flood Hazard News described plans to develop an Emergency Managers Weather Information Network for the Denver area. EMWIN is a National Weather Service program that allows communities to develop their own unique applications. In addition to providing an effective low-cost way to disseminate severe weather and flood information, it can also be used to relay civil emergency messages, thus having the potential to supplement interagency communications for homeland security purposes. With the District providing the initial $15,000 in startup funds, local emergency managers secured an additional $34,000 from a Homeland Security Grant. This money will be used to acquire EMWIN radio equipment and software for use in emergency operation centers throughout the region. Adams County is planning to host the satellite downlink site and Xcel Energy is investigating their ability to host the rebroadcast station. Skywarn Systems, Inc. of Fort Worth, Texas is providing the design and consulting services, having developed a similar project for the Dallas/Fort Worth area. Initial deployment and testing is expected by late Spring or early Summer 2004. The District has been a sponsor for the Community Collaborative Rain and Hail Study for the past two years. Nolan Doesken, Assistant State Climatologist, has led this unique program that recently gained national prominence as the recipient of a 3-year National Science Foundation grant totaling $897,000. CoCoRaHS was started by the Colorado Climate Center at Colorado State University following the July 1997 Spring Creek flash flood in Fort Collins. Congratulations to Nolan and to the many CoCoRaHS volunteers, staff and partner organizations. Anyone interested in measuring rain, hail and snow where you live or work should consider becoming a CoCoRaHS volunteer. Just visit www.cocorahs.org and join with hundreds across Colorado who enjoy participating in this valuable climate study. The District's ALERT flood detection network continues to grow, providing valuable early flood detection and decision support for local emergency management and response agencies. The 165 station network includes 145 rain gages, 80 stream gages, and 17 weather stations (wind, temperature, humidity, pressure and other parameters). The District's ALERT webserver is highly relied upon for accessing real-time data and sending text messages when alarm thresholds are exceeded. Nine new stations were added to the ALERT network in 2003. 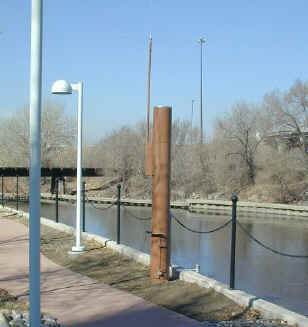 Three rain gages were installed at Chatfield Dam, the Denver Zoo and the Roslyn Public Works Facility in north Denver. A fourth rain gage was recently made ready for 2004 operations at Fire Station No. 12 in Aurora near I-70 and Airport Blvd. 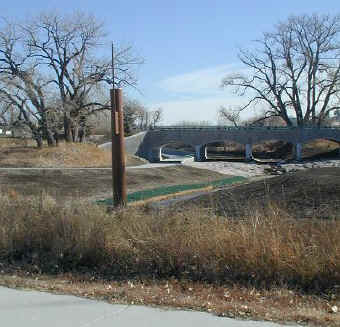 Four combination rain/stream gages were installed on East Plum Creek near Haskins Gulch in Douglas County, on Sulphur Gulch in Parker (the newest addition), on Sanderson Gulch in Denver, and on the South Platte River near the Denver Wastewater Management Division's 3rd Avenue office building. A new weather station at Aurora Reservoir is the latest addition to the ALERT mesonet. The Urban Farm at Stapleton weather station was discontinued in June, but plans are moving forward to relocate it to another site near the old Stapleton Airport. A few more stations are expected for 2004 operations including rain gages on Shop Creek in Aurora and in the storm approach zone for Denver southwest of Marston Lake. New stream gages are anticipated for Lakewood Gulch and Goldsmith Gulch in Denver, and Sand Creek, Murphy Creek and the Gateway drainage area in Aurora. 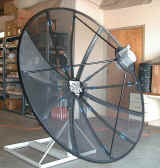 DIAD Incorporated (now OneRain) of Longmont provided the 2003 ALERT maintenance services for the 12th consecutive year. DIAD's name change occurred this past fall when they merged with NEXRAIN, Inc. NEXRAIN is located in the Sacramento, California area where they specialize in estimating rainfall from radar and surface measurements combined. 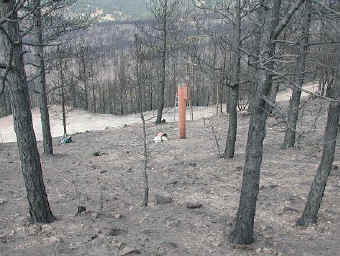 Late season wild fires broke out in Boulder and Douglas Counties with the 2002 Hayman Fire and its recurring floods still fresh in the minds of many. ALERT data is relied upon for fire weather support almost as much as flood detection. The NWS forecast office in Boulder reminded us of this when they sent the following email: "Just wanted to let you know that the ALERT mesonet data was very valuable for our support of the wildfires on October 29. The Button Rock, Calwood Ranch, and Sugarloaf stations were perfectly located to cover the fire near Jamestown and were used heavily, while the Highlands Ranch and Castle Rock stations aided our knowledge of the weather conditions in that area. There was a lot of variability of humidity and wind in both time and space on that day, but your network made the conditions at the fires perfectly clear. Those of us on shift that day were very glad to have the data!" Looking ahead, the District intends to continue improving its public webserver capabilities by implementing more data integration and interpretation features to further simplify the flood threat recognition process. The District is also planning to develop a second password-protected webserver with similar capabilities for emergency use. A new project in Boulder will soon be underway to further improve flood threat assessments and early notifications by incorporating GIS applications with a real-time hydrologic model for Boulder Creek. The District's flash flood prediction program provides forecast and notification services directly to District local governments from April 15 through September 15 each year with this past year being our 25th year of service. HDR Engineering Hydro-Meteorological Services of Denver provided the operational forecasts during 2003. Bill Badini was HDR's project manager and lead meteorologist. John Henz provided the overall training and support for HDR meteorologists. This was the third consecutive year for HDR as the District's meteorological services provider. The 2003 flood season gave the District its usual number of trouble days, but passed by without major disaster. Once again we consider ourselves fortunate and wonder how long our good fortune will last given the flood history of this region. The March 17-20 snowstorm was without question the biggest single hydrologic event of the year with nearly 4 inches of liquid moisture falling over much of the District and our mountain watersheds. Rivers and streams were running high as the snow melted, but again we were fortunate that temperatures remained relatively mild during that period. If daytime temperatures had reached into the 70's, we would be telling a much different story about the March flood of 2003. An early evening storm caused considerable excitement in Boulder County this day, with the NWS issuing its first flash flood warning of the season that affected the District. The warning area included Boulder Creek and other tributary streams west of Boulder. The storm system developed along a narrow north/south line in the foothills just west of the City. One CoCoRaHS observer reported 3.02 inches. The ALERT system generated its first rain rate alarm of the year at the Betasso gage at 7:28 PM, where the rainfall totaled 2.56" in just over an hour. Localized flood damage was reporting in the mountains, but by the time the water reached Boulder the flood had attenuated to non-threatening levels. The Boulder Creek gage at the bridge below Fourmile Creek rose nearly 2 feet in 30 minutes with an estimated peak discharge of 500 cfs. Peak snowmelt runoff occurred 2 weeks later with the flow rate exceeding 1000 cfs. The storm's small aerial extent kept the peak flows on the major streams relatively small with damages being limited mostly to mountain gravel roads. A surprise storm hit the District in the early morning hours between 2:30 and 3:00AM in the vicinity of US-36 and Sheridan Blvd. The storm caused some localized flood damage to private properties according to news reports. Rainfall intensities of 0.5 inches in 10 minutes occurred in Adams and Denver Counties. Notice of the storm came first from the NWS at 3:20AM. HDR forwarded the information to affected jurisdictions. The morning storms were minor in terms of flood impact but the cooperation between the NWS, HDR and District staff is noteworthy. The NWS deserves much thanks and credit for their coordination efforts. Later in the day the storm activity returned with rain reports of 1.5" to 2.5" in south Denver with 1" diameter hail. Following the rains of June 17-19, summer heat and dryness set in with only one message day occurring in a 28-day period between June 20 and July 17. The extended dry period was broken this Friday evening when thunderstorms near the Wyoming border sent out strong gust fronts to the south, causing a line of intense storms to develop between Parker and western Aurora. Two inch per hour rainfall was measured in SE Denver causing flooding along Goldsmith Gulch. Messages were issued for Denver around 9:45PM and the NWS issued a flash flood warning at 10:09PM. Fortunately the storms weakened and dissipated after 60 to 90 minutes, but not before enough rain fell to flood the Logan Street underpass of I-25 (a.k.a. Lake Logan), causing T-REX to close the freeway until 10:30AM the next morning. Goldsmith Gulch rose nearly 5 feet at the Eastman Avenue ALERT gage and measured a peak flow of approximately 1100 cfs at 10:30PM. Downstream at Iliff Avenue some cars in a parking lot were flooded. This was due to debris blockage at the Iliff culvert trash rack, which has caused problems in the past. Efforts are moving forward to remedy this. Flood problems were not limited to Denver with Arapahoe County and Aurora also being hit by heavy rain. This was another flash flood warning day for the District in Douglas County, where a storm dumped an estimated 3 to 4 inches of rain near Roxborough Park. This rather large storm missed being measured by both the ALERT system and CoCoRaHS observers, where highest reported amounts were 0.71 and 0.58 inches respectively. The ALERT measurement was made by the West Plum Creek gage on Pine Cliff Road. The 3-4 inch estimate was from the NWS doppler radar. No significant flooding was reported. This day brought to a close a 5-day stretch of the most threatening rainfall potential of the year. The NWS issued their final District flash flood warning on this day when an early afternoon storm brought flooding to the Golden area. One report received by the NWS indicated that there was 4 feet of water "over" Colorado Highway 93. After following-up on this, it appeared that a more accurate account would have been that there was 4 feet of water across the highway, which forced the closure of one lane. Regardless, the media covered the event very well and a considerable amount of flood damage did occur to some homes in the area. The storm was very localized. The Van Bibber Creek ALERT gage on SH 93 measured 1.34" with 0.91" occurring in just 15 minutes. Media reports also noted that the flooding would have been much worse had certain drainage improvements not been completed. More information about the District's local flood warning program, its ALERT system and the 2003 flood season can be found by visiting the website alert.udfcd.org. Annual reports by HDR Engineering and OneRain Incorporated are also available.